When planning a trip, we often search for an unusual business, place or activity that might result in a good story. During the past couple of years, we have visited a family business in Tennessee making trolls, ridden a mail boat on a Wisconsin lake and attended President Jimmy Carter’s Sunday school class. It was fun, educational and worthy of telling others about. 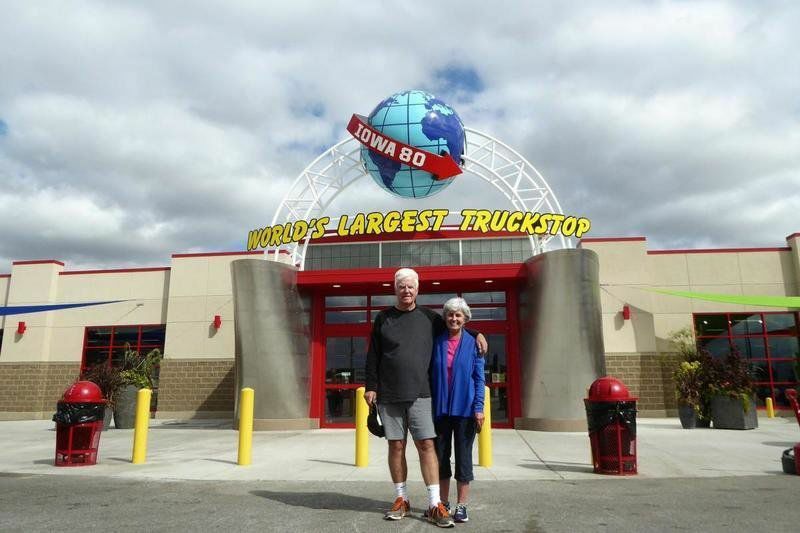 In organizing a September road trip through Central and Eastern Iowa, our friend, Lynda Damrill, suggested we explore an Iowa truck stop on Interstate 80. The world has multitudes of truck stops, so we wondered what was so special about this truck stop that a visit might make for a good story. With a little Internet investigatory work, we discovered Iowa 80 Truckstop claims to be the world’s largest. It boasts a resident dentist, barber and chiropractor. Being interested in just about anything that might be the “world’s largest,” we penciled it in. Approaching westbound on I-80 from Davenport, Iowa, we pulled off at Exit 284 and entered the truck stop parking area. The place was immense, with cars, vans and pickup trucks parked on one side of the main building and rows of semis on the other. Several additional buildings were scattered about the property. The entrance nearest our parking spot led to a large food court sporting a Wendy’s, Pizza Hut, Taco Bell, Dairy Queen, Orange Julius, Caribou Coffee, Einstein Bagels and Blimpie. We had emailed Iowa 80 marketing manager Heather DeBaillie requesting a meeting to discuss the facility. She agreed and was patiently waiting at a table near Caribou. She replied it services 5,000 customers per day in a 130,000-square-foot building on 200 acres (85 developed) of property. This sounded pretty impressive and marked the end of this line of questioning. Iowa 80 has become what it is today due to the foresight of Bill Moon, who in 1964 managed a modest Amoco (now part of BP) station at the same location. During several years, he purchased land surrounding the station, and in 1984 acquired the station when Amoco decided to exit the truck stop business. Bill continued to expand the business, while acquiring and building three additional truck stops in Missouri and Oklahoma. The firm has been managed by Bill’s son and daughter since his death in 1992 at age 59. Our tour began by walking from the food court to a 300-seat full-service restaurant that boasts a 50-foot buffet line ($10.39). Then it was upstairs to meet full-time truck stop dentist Tom Roemer who said most of his work involves emergencies although he does about any type of procedure other than implants and root canals. The office was quite small with two chairs and a receptionist. Kay thought Tom could be a candidate for a cover of Gentleman’s Quarterly. Exiting the dental office, we strolled around the corner to the barber shop where a trucker was getting his hair cut by a female barber. Then on to visit chiropractor Justin Seifert who commented that long-haul truckers frequently suffer lower back and neck problems. Justin also conducts Department of Transportation physicals and drug tests. Heather showed us the movie theater (truckers can request a specific movie), library, chapel, TV room, laundry room and showers before heading downstairs to a mammoth showroom that included an embroidery shop, a wall full of working truck lights, a selection of chrome exhausts and accessories and a full-service Verizon store. Heather described this area as a “trucker’s candy shop” frequented mostly by independent truckers. The area also included a beautiful semi, its trailer painted with famous scenes of I-80 across the U.S. Heather said Bill Moon had tried to purchase the semi used by Jerry Reid in “Smokey and the Bandit,” but the price was too high. Exiting the building, we climbed in Heather’s car and headed for the Truckomat where drivers pay $75 for a full truck scrub by five employees, including two standing on high scaffolds along both sides of the trailer. Cabs only are $35. The truck stop also has a Dogomat for washing dogs (many truckers take dogs along) that costs $5. Our last stop was Iowa 80’s real prize, a large museum filled with magnificent restored trucks, some quite rare. We spent an hour in the museum that was worthy of at least a half day. The collection included a 1929 REO Speedwagon EX, a 1911 Walker Electric, a 1910 Avery tractor and more. What a treasure this place is. Entrance is free with only a request for donations. By late afternoon, it was time to bid goodbye to Heather and Iowa 80 Truckstop. Our four-hour tour proved to be quite an eye opener. David and Kay Scott are authors of “Complete Guide to the National Park Lodges” (Globe Pequot). Visit them at mypages.valdosta.edu/dlscott/Scott.html. View past columns at www.facebook.com/DavidKayScott. The Scotts live in Valdosta, Georgia. If You Go…Getting there: Iowa 80 Truck Stop is about 15 minutes west of Davenport, Iowa, at Exit 284. Dining: Fast food, a buffet and ordering from a menu are all available. Hours: The main restaurant and Wendy’s are open 24/7. Other fast-food restaurants have more normal hours. The museum is open 9 a.m. (noon Sundays) to 5 p.m. Memorial Day through Labor Day. It is closed Monday and Tuesday the remainder of the year.